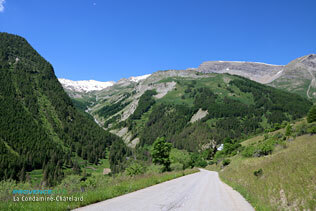 14 km from Barcelonnette on the D900 going to the Serre-Ponçon lake. 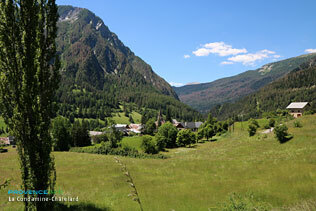 La Condamine-Chatelard used to be a prosperous town with a thriving economy. For the last 150 years it has been watched over by the impressive fortifications of Tournoux Fort. The village has a slightly austere appearance, with some big grey houses brightened by coloured shutters. Among its high points, the air is magnificently pure and there is a marvellous torrent that rumbles down the mountain, from whose banks trout fishing is not only authorised but recommended! People interested in military buildings will be sure to visit the Tournoux Fort, dubbed "the 19th century military Versailles", the central part of an impressive 19th century fortress with its buildings clinging to the mountain side. Tournoux Fort. Châtelard hamlet perched on a rocky spur. 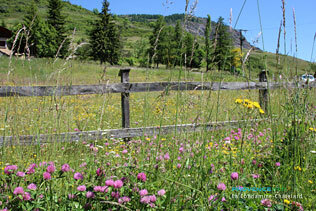 Villard hamlet known for its artists and craftsmen, tanner, ceramicist, potter and herbalist. The sun dial at Toumoux dates from 1817. Champ Félèze leisure centre (man-made lake, white-water sports). Flying school: airplanes, gliders and model aircraft with remote controlled helicopters. Numerous hiking trails (several national hiking paths pass through here). Mountain-biking. 4-wheel drive patrol in the vale of Parpaillon (end of August). In winter, downhill skiing (6 ski lifts) at Ste Anne. La Condamine resort (Alt: 1,830 to 2,400 m, 6 km away). Snowshoe treks, treks with sleigh dogs. Driving on ice circuit, waymarked path.